on March 1, 2016, 7:06 p.m.
Out of 17 countries surveyed worldwide, Malaysia and Indonesia are among the least concerned about climate change – but among the most concerned about economic stability. A historic deal to place limits on the rise in global temperatures to 2C above pre-industrial levels was reached in December, after the combined efforts of nearly 200 countries delivered consensus on carbon emissions. This is the first climate deal to commit all countries to emissions cuts, which will come into force in 2020 through a combination of legally binding and voluntary measures, and the package includes $100 billion a year in climate finance for developing countries by 2020 with future finance also promised. 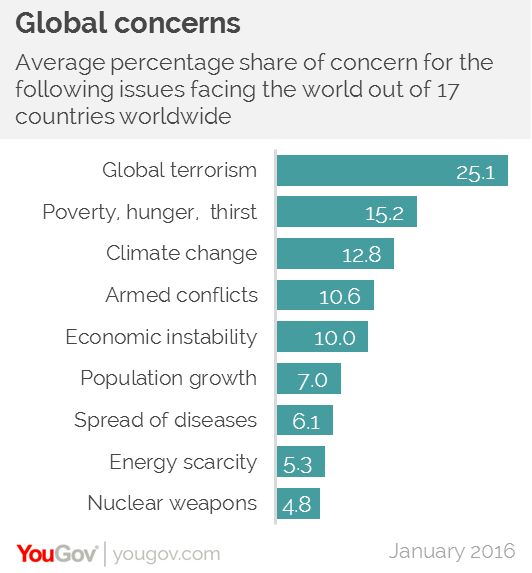 New YouGov research reveals climate change is considered the third most serious issue facing the world by the world's population, with a 12.8% share of concern, behind international terrorism (25.1%) and poverty, hunger and the lack of drinking water (15.2%). Samples in 17 countries throughout Asia, North America, Europe, the Middle East and Australia were asked during November – December 2015 to say which of nine issues facing the world they consider to be a serious issue, and then which one they consider to be the most serious. The percentage scores represent an average of these two, so as to include both the breadth and intensity of concern. In Asia Pacific, Malaysia has a share of concern of 11.2% and Indonesia of 11.4%, below the global average (12.8%), and above only UK (10.8%), USA (9.2%), and Saudi Arabia (5.7%). In contrast, Malaysia is the most concern of economic instability with concern score of 17.4%, more than 7 points above the global average. 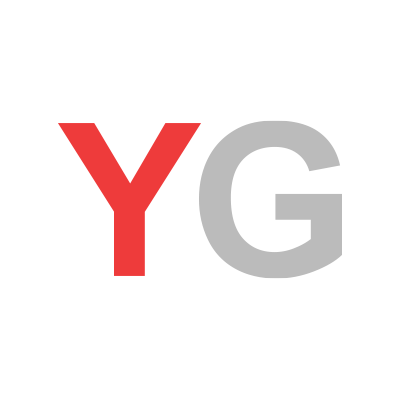 Hover over the visualisation below to see where each country ranks in concern for each issue, and the extent to which each issue is seen as problematic. The UK has the third highest population density of the 17 countries (660 per square mile), perhaps explaining some of the concern over population growth. However Singapore (18,513 per square mile) and Hong Kong (16,444) have far higher densities while having far lower shares of concern about population growth (5.1% and 7.8% respectively). Germany is only slightly less densely populated than the UK (593 per square mile), but is less than half as concerned (5.6%) about population growth than Britain. It is likely Britain's exceptional concern over the issue is linked to the politicisation of immigration, which has been seen as the most important issue facing the country since May. Saudi Arabia, located in the most turbulent area of all 17 countries and in the midst of conflict with Yemen, is far more worried about armed conflict than any other country (scoring 25.8% compared to an average score of 10.6%). China, whose economy is in trouble in part due to the volatility of oil prices, is the most concerned country about limited energy resources (scoring 15.2% compared to the average of 5.3%). The data for France was collected a week after the ISIS terror attacks in Paris. France is the most concerned country about international terrorism with a 33.7% share of concern compared to the global average of 25.1%. There is a general overlap between the difference in concerns of Western and Eastern women compared to men, however the gap is significantly larger between the genders in the West. 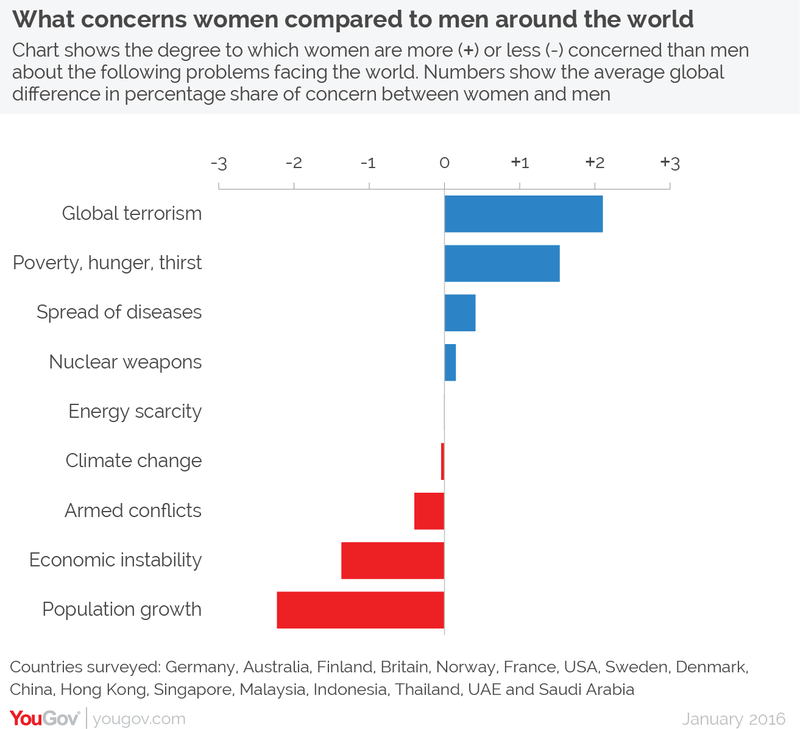 Women find global terrorism a more serious issue than men, and in the West the gap is 3.4. Women are also more concerned about poverty, hunger and thirst – with a gap of two points between the genders in the West. Eastern women tend to be more concerned about armed conflicts than men, and also about the spread of infectious diseases. In both regions men view population growth and economic instability with greater seriousness, but again this gap is exaggerated in the West.